I'm really excited to be writing a post for Why We Love Green about homemade DIY all-natural baby wash! A few weeks ago, I posted about the dangerous chemicals found in Johnson and Johnson (and many other companies') baby products, which left a lot of my readers wondering, "Well, what do I wash my baby with now?" One mom, in particular, was very concerned with the fact that since the FDA doesn't require companies to list some dangerous contaminants on bottles since they aren't "technically" ingredients, how do we really, truly know what is in the products that we're using. While the best we can hope for with the products we purchase is that the companies are being honest when they advertise their products as "natural" or "organic," we can take steps of our own at home to be absolutely sure that what we are putting on our baby's skin is definitely safe. 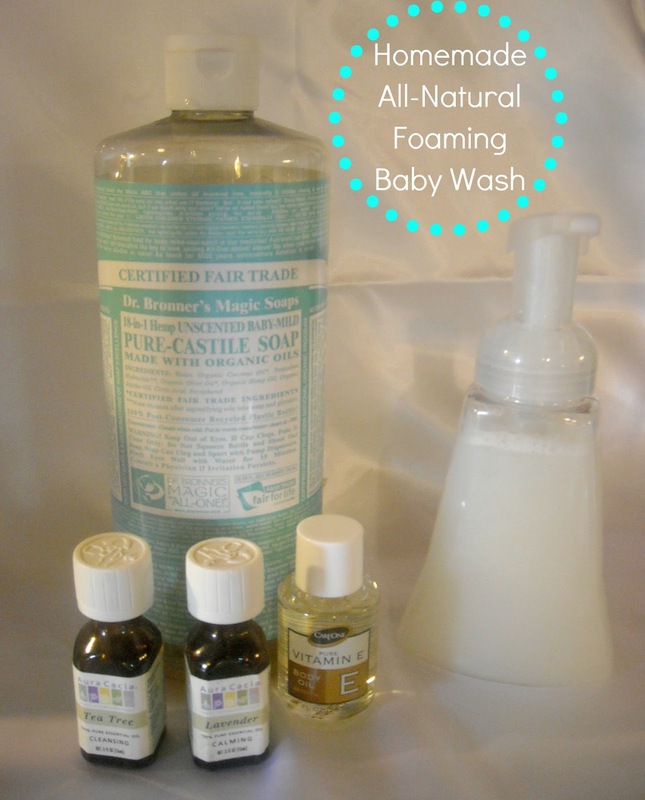 To avoid putting potentially harmful chemicals onto my son's skin, I make my own baby wash. It's super easy, super cheap, and super sudsy! I'm happy to share my recipe with Why We Love Green's readers! Hopefully, you will be able to avoid using those dreadful products found on the market today. This would be a great thing to share with any other mommies or daddies that you know, and it would even be a wonderful gift idea for a baby shower (instead of the bottles upon bottles of J&J products that typically fill those gift bags)! You'll need to use a foaming dispenser for this. You can easily find them at most chain stores or craft stores. The pump does a great job at giving you nice, thick suds to wash your little one, and also does a great job at making the soap last a long time. One normal sized bottle of this lasts us close to two months - and there are many days when my son needs two, even three, baths! ~ In the soap bottle, combine about 1/4 cup of Dr. Bronner's, a few drops of Vitamin E Oil, and about 10 drops of essential oils. I use three drops of tea tree oil for the cleansing properties (don't use too much of this though - it can be rough on sensitive baby skin if you use too much) and seven drops of lavender oil for the yummy smell. You can, of course, forgo essential oils if you don't want any additional scent. ~ Fill the bottle the rest of the way up with water and close the lid. Gently mix the ingredients up. All done! Wasn't that easy?! Even easier than wrestling a toddler into the bathtub!! Leah blogs at Crunchy Farm Baby, where she writes about all things having to do with a crunchy lifestyle - natural/attachment parenting, vegetarian/vegan cooking, breastfeeding, babywearing, gardening, raising chickens, chemical-free cleaning, natural pet care, toddler activities, and fun stories about life on a small farm in Pennsylvania!